We're taking a momentary break from all the book publicity to celebrate the first year of our son's life. No big deal! Psyyyyych. It's a huge deal. I love this kid soooooooo much. Basically, I took three different recipes and put them together to make a layer cake. Teddy loves citrus, so I put a few dollops of lemon curd in between each cake layer, and then I iced it all with the vanilla frosting (which I obviously dyed with food coloring). Also, I used Meyer lemons for the curd because we have a Meyer lemon tree (God bless, Southern California! ), but you could definitely use regular lemons. Preheat the oven to 350F. Butter the cake pans and line the bottom of each with parchment paper. Butter the paper and dust the pans with flour, tapping out the excess. Separate your eggs. Measure the milk. Sift and measure the flour. [I always skip the step of sifting flour, though I'm sure my cake would be somewhat lighter if I didn't.] Stir in the baking powder and salt. In another bowl, beat the softened butter until light and fluffy. Add the sugar. Cream until it's also light and fluffy. Beat in the egg yolks, one at a time. Add the vanilla. When well mixed, add the flour mixture and milk alternately, starting and ending with the one third of the flour. Stir just until the flour is incorporated. In another bowl, whisk the egg whites to soft peaks. Stir one third of the egg whites into the batter, then gently fold in the rest. Pour the batter into the prepared pans and bake until a toothpick inserted into the center comes out clean, about 30 to 40 minutes if using two cake pans and more like 20 to 30 minutes if using three cake pans. Note: This recipe makes about two cups of curd, which is more than enough for the cake. Maybe use the rest on top of toast for a special breakfast? Or on top of zucchini bread? I don't know! Grate the zest of one lemon and set aside. Juice the lemons; you want about 1/2 cup juice. Beat the eggs, egg yolks, milk, sugar and salt together until just mixed. Stir in the lemon juice and the lemon zest. Add the butter. Pour into a bowl or clean glass jars to cool. Cover and refrigerate for up to two weeks. Beat together butter and cream cheese with a mixer on medium-high sped until pale and creamy, about 1 minute. Reduce speed to low. Add confectioner's sugar, about 1 cup at a time, beating well after reach addition. Add salt and vanilla and beat until fluffy, about 3 minutes. So much cute packed into one year. Congrats! Aww Tedddyyyy! Isn't video so incredible? I always wish I had more, especially in the early months when I wasn't thinking proactively. 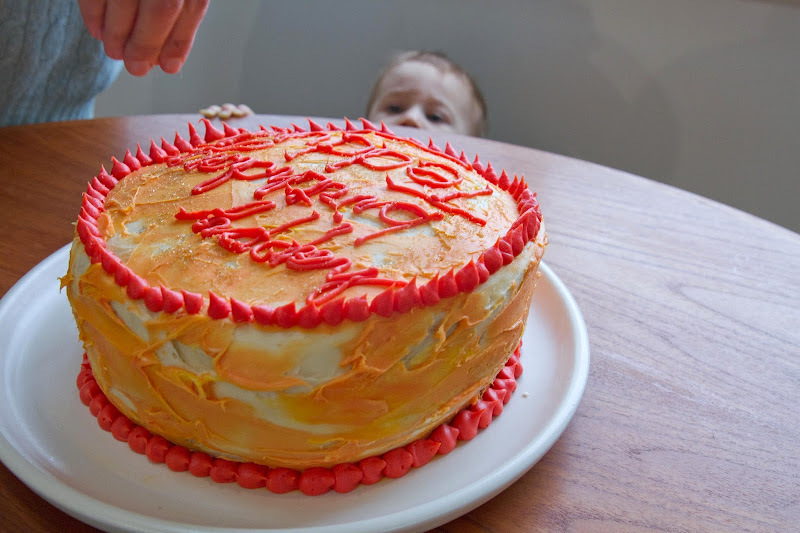 I've never made a decorated cake before but my daughter's first birthday will be my gateway (excited!). I wonder if I'll cry? This is so cute! Happy birthday, Teddy! I love the Mavis interactions and the pure bliss while he eats his birthday cake. You're so lucky to have Matt with that video camera! This was great (especially the Mavis bit.) Happy Birthday to your Teddy! I love that smiley little dude. Happy Birthday Teddy! He is gorgeous! I love that you have recorded him, I think it's such a lovely thing to do & look back on! Plus this cake sounds to die for and I really like that you put a citrus twist in it especially for him :) Best mum award!! I LOVE TEDDY SO MUCH!!! Omg, seriously. It hurts. Happy birthday, adorable boy! You guys made one adorable tiny human. Way to go. This video is the perfect cure for any kind of blues. It makes us smile every time we watch it. We love Teddy!!! Am I the only one here who just wants to comment on the cake? Solid cake. Omg. That video is amazing and Teddy is one happy/lucky little guy! Molly and I made the cake today... YUUMMMM!!! Bruce would love that video. I do, too! happy birthday to all of you! re: Matt, I know!! Beyond lucky. Teddy is looking forward to Malcolm's!! Thanks, MARE. It came out a little Hunger Games-esque. Not intentional! What a sweet video. Every parent should have a video of all the first year cuteness. You'll need it when he hits three. do they really start walking so early? we're at 4 1/2 months and i am in no way ready!